i love it!! especially with your purple-y tights! Really cute! I love the bold, geometric print! Thank you dear :)! I am all about bold prints! 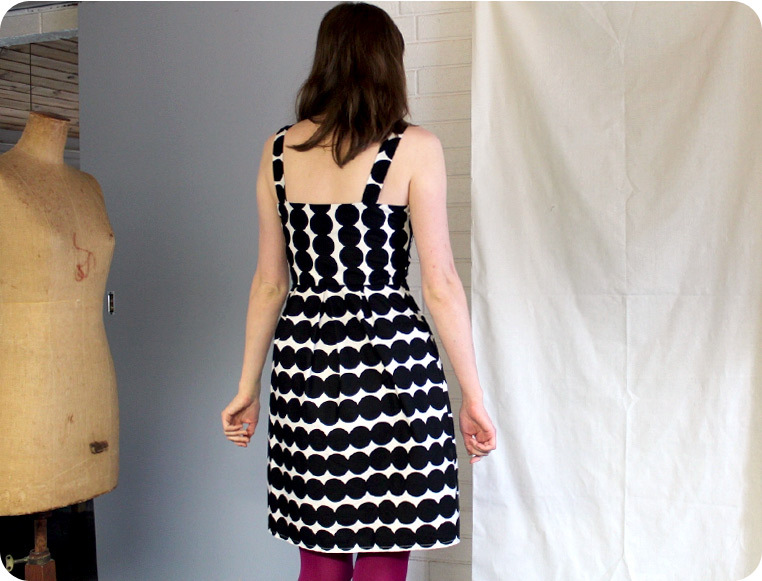 I love making dresses the most too- I just need to give in and make nothing else- I’ll start with this! I love the tights with it too. Love the spots! It’s amazing what you can get out of 1 metre! Thanks! Yes it really is a brilliant pattern. I guess I cheated a little because I wasn’t including the bodice lining, but I usually use a different fabric for that anyway. You are my squeeee of the day. Love this!! Killer necklace and tights. Aw thank you :)! I’m glad you like the necklace and tights. The necklace is new. Reminds me of B5351 too which I always thought looks like the Colette Hazel and Lily dresses had a baby dress. Great dress! 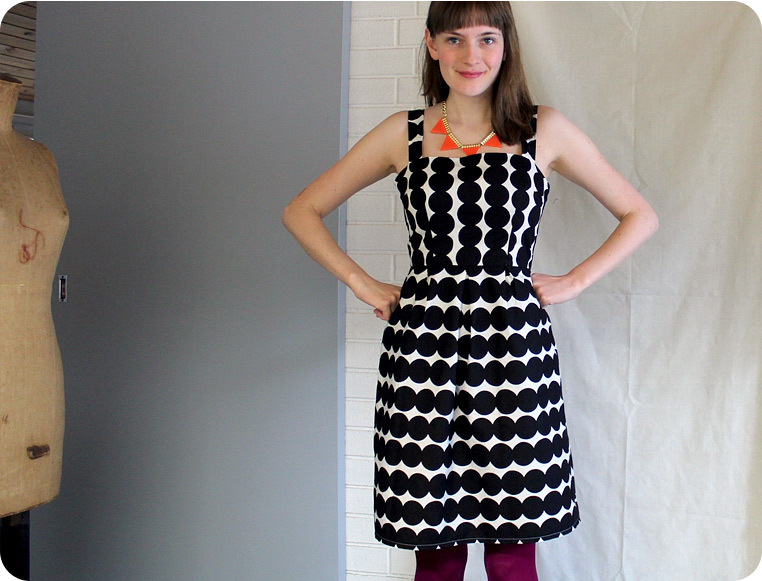 I love how you changed the direction of the dots on the bodice.The orange necklace and purple tights are so fun! I love this! Just perfect dots! Gorgeous. I love this! 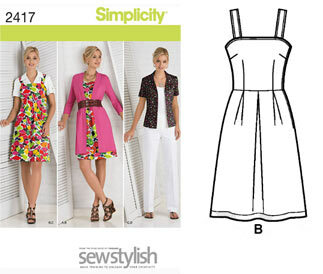 I love that you changed the directions of the circles in the skirt! it took me a while to notice but I love it! what kind fo fabric did you line the dress with? I’m always at a loss when it comes to lining, I tend to never line my dresses because I like the airiness on cotton and don’t always feel the need to line it, but when I do, I NEVER KNOW WHAT FABRIC TO USE. Thank you! I line it with a cotton batiste and I would really recommend it. It’s basically a very thin lightweight cotton (sort of like a voile). I prefer this to a slippery polyester lining! Not only is the batiste light and airy, it is also easier to sew than that slinky polyester lining and the last thing you want to wear in the summer is polyester right up against the skin! I love your dress. I agree with you, sometimes the pattern companies have poor styling for the envelop. 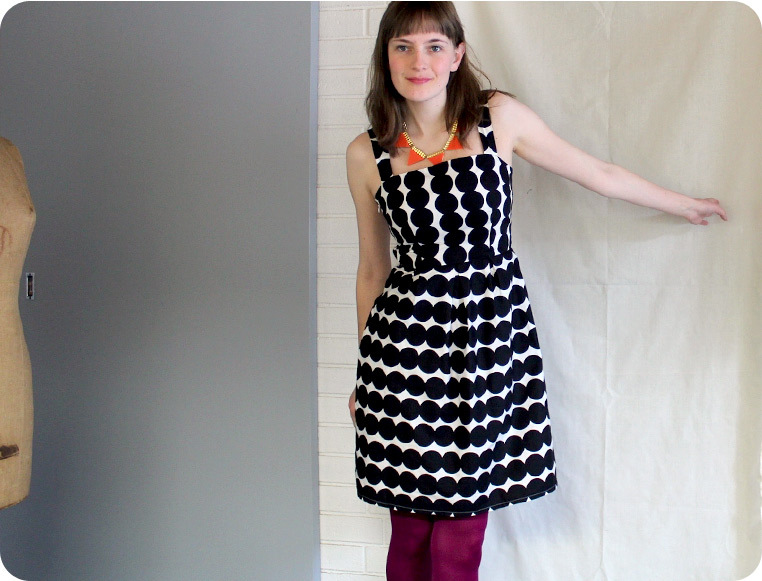 I think simple shapes like your dress are perfect associated with loud fabric. You did a great job. Thank you so much :)! Good point- simple is often best with loud fabric. I love how you changed the fabric orientation on the bottom! I would have definitely overlooked this pattern based on the styling, but yours turned out great! Thank you :). I love your blog! This dress is so gorgeous & it goes great with that necklace & purple tights. Hiiii Im a new comer to your blog. Thanks :)! pops of colour always help! Wow – this dress is stunning. I am enjoying reading your blog. So glad I discovered it!